I bet you have visited and seen these proof of daily, monthly and yearly payments. Certificates of being the most honest employee online. Fake landing pages - 279 million in 12 weeks? That would be 1209 million in a year? For everybody who will join? 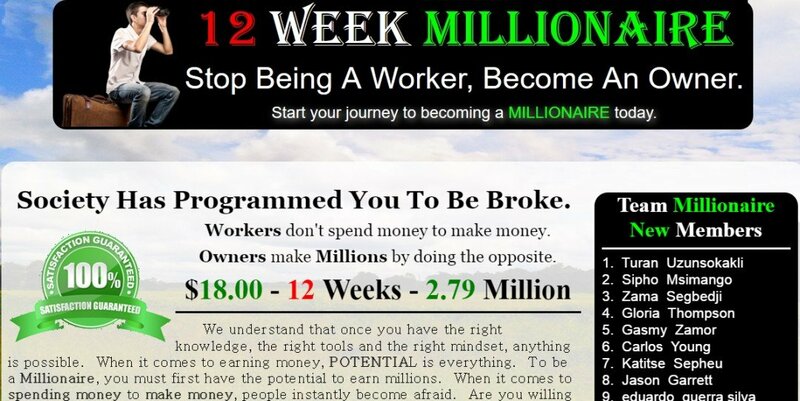 I see 10 Team Millionaire New Members in this add, and they claim to have earned together 12090 million dollar a year? Never read about this in the newspaper. There are indeed a couple of programs online who are proven to be genuine. One of this programs is learning how affiliate marketing works. A way for a company to sell its products by signing up individuals and pay them a pre-arranged percentage when a sale takes place. otherwise, all my neighbors would drive a Ferrari. which can grow into a full online income. Hard to believe those websites exist! And, unfortunately, many people fall for it and get burned! I stopped looking for better either Dominic :) Feels like home here. I agree WA is one great example. Thank you Loes. I blogged about honesty today. Essential in business. Sing it from the rooftops Loes very well said, thank you. A really great post Loes. It's sad that so many new to internet marketing get caught with scams. If only they knew about WA!! Well done. You got the message right! Great post, Loes. Thanks for keeping it real. Hmmm... wonder if I could be 1/20th as good as them... heck show me how to make ten bucks... I'm all in! If people actually realised the value here at WA then we would get tonnes more refferals i think,people in general are sick of looking at ads that promise great things when most of them are complete rubbish!!! In all honesty what we get here for the cost is amazing! We get 50 websites if we like! and all the other rescources as you know. Yes, the value here is incredible! We know that, its convincing other people! All the scams online dont help as folk dont know what to trust nowadays! On the lookout for your blog about it! Hi Loes, an eyeopener. Irv. I am very happy to have this opportunity and like the transparency here. I joined on 6/4, published on 6/9, gotten approved by a few and still applying for more. Everything I learned was new to me so I find a lot of value in a real education rather than sales & upsells, and team building. Those are usually just following some one else's script anyway and sometimes you just can't delivery it the same as someone else. I think the WA referral system is just an added bonus to the truly unlimited potential. In any case I wish much success and happiness to you and yours. Good question - why is it not on the news? Even the Bubblews mini-post site made the evening news, although its success did not last. But for a while it generated significant money. Hi Diane, when people are making millions on the internet, it sure will become evening news ánd a hype! In my opinion one of the weak things about wa is there are no upsells. Now you first must understand the purpose of an upsell is to expose you to the next set of tools to increase your income. The first one we ever bought took us to $5000.00 per month. There is nothing in WA to do that. WA works for some people. Others say they have never made a dime and have been Faithfully paying membership dues for years. An upsell is only for people who are making money. Don't confuse it with a Hustle. A Hustle is something under $50 that the average person will simply go for. An upsell will cost at least $1,000 and give you something useful for your money. Beware of the Poor Man's mentality. It is what keeps him poor. But your general post I agree with. Depends on how you look at it, I am glad they have no up selling, WA works for everyone the same, only not everyone will work the same with the tools WA is supplying. Loes, I totally agree with you. No upsells for me means total transparency and honesty in WA. There are plenty of ways to make more money. As long as you're not brainwashed into thinking there is only one path. Wa appeals to a certain type of client. I know for one I should not even be here. However my new program was inspired by Marion Blacks website building classes. I know I can teach someone how to make $500 in 60 days. They can easily turn that into $2,000 over the next 60 days. And then they are set. The paragraphs are out of order because I added this last. In fact that's how we learned ABOUT WA back in 2012. Many people were leaving wa coming over because they had maxed out at 200 or $300 per month and they needed much more. I love them because they work for us. I dont like Hustles. Too true Loes. Thanks for always looking out for us. Very true Loes! I am getting daily emails with these type of unreal offers of making money! Have just been deleting them as spam! Very happy to be here at WA! We all have the life experience that we should recognize the truth. Tell it likes it is Loes ! Civility has a place in our discussions of course.............and then every once in a while you just have to lay it out there for folks to see! Thank you Cynthia, I like awesome! I'm overwhelmed with offers. There is no quick, easy money. Very inviting for potential affiliates, Loes! A wonderful creation. That's why I trusted WA in the first place. They don't promise something for nothing. They offer training for those willing to work. I entered into this whole online world with the completely wrong idea that I would become rich in a couple of months. Now that the reality is fully understood it is much more comforting, as in the back of my mind I always new there was no easy way and now i'm focusing on helping others and building things up the right way. Thank you Loes for your help along the way. Thank you for this Loes. It really gets to the heart of what separates WA from the scams. Hi Loes, thanks for sharing this post, it's always better to say the truth, quick money won't happens, it's better to work hard and smart on a business that in time will make money. The Problem with people is that they want to learn to fastest way to make money without putting much effort, so they buy into the scam! I know Sadie:( I was also too trusting in the past. ....Just kidding!! Great work here Loes showing us all how easy it is to be a scammer! You are so right there are no shortcuts and the only place the 'money' comes before, 'work' is in the dictionary! You make me smile from ear to ear Peter:) Thanks! Hi Loes and I agree with you 100%. No quick fixes to earning an income online and anyone who tells you its possible in a very short time is obviously lying. Hard work, dedication and maximum effort are required to just earn a reasonable income from the internet that will enable you to have it as a full-time 'Job' that allows you the freedom to do what you want, when you want that a normal 9 to 5 will not. Enjoy your Friday in the Netherlands Loes and take care out there. Thanks Robert, quite right, it takes dedication and hard work, the only difference is, that I like this work:) Have a great weekend Robert! I will have a great weekend Loes. Edinburgh is starting to get really crowded now with lots of visitors from overseas coming for the festivals and the tattoo. Thanks Loes! I will hopefully take you up on that one day. Hello Loes, thank you for your blog post! I'm amazed what some Internet marketers send me, allegedly if I joined these programs, I would be a millionaire several times over within a week! Generally I delete these emails and unsubscribe from them! Everything takes time and the best way is to learn step-by-step and Wealthy Affiliate is the perfect way to get started! All the best to you, Roy. Thanks Loes! You are definitely speaking the truth here! I really enjoying all that you post! Have a Great Day! There are too many scams out there. We need to use our common sense. Thank you for reminding us again, Loes!